…basically just my excellent adventures. 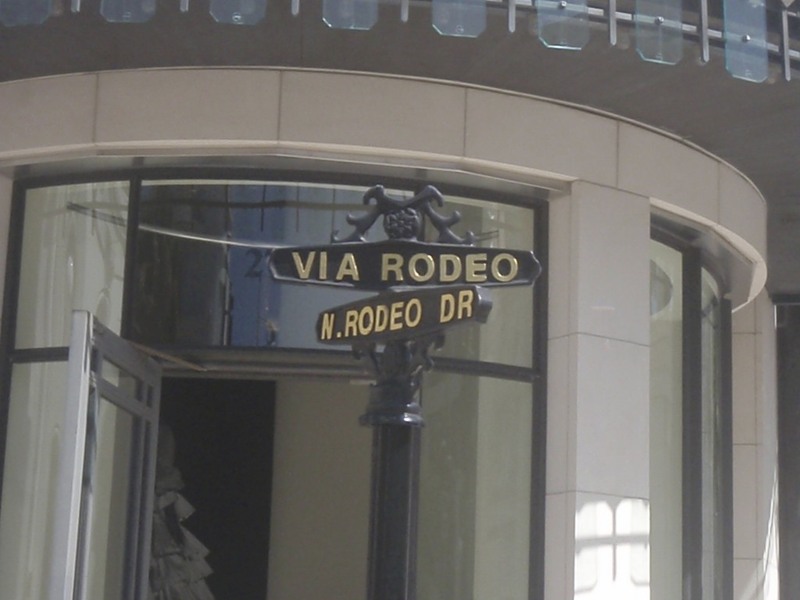 You are currently browsing the tag archive for the ‘Rodeo Drives’ tag. Once Georgia arrived from her flight a couple of hours later, we decided there was no time to waste. We got out our map, our tourist clothes and our super jet-lagged excitement and started wandering down Hollywood Boulevard, shopping a little and being excited about the stars and their names. 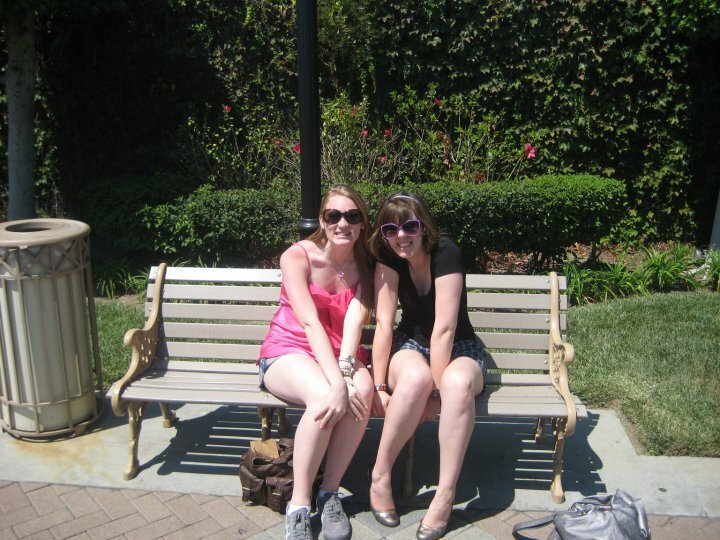 We hit up Madam Tussauds, where we had our first picture with my favourite person on the planet, Barack Obama (yay! ), and a bunch of other fabulous wax models. It really trips with your mind after a while though – I stopped being able to tell the difference between who was real and who was fake. 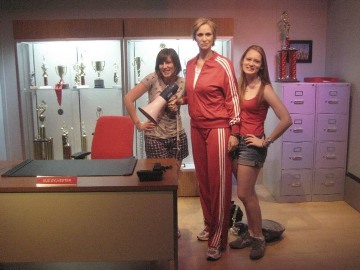 The ultimate excitement hit us when we saw Sue Sylvester, the newest addition to the wax collection, complete with a cross-trainer, Cheerios trophies and her journal! I just like…love her so much. We jet-lagged squealed a little when we saw her. I would've brought you a coffee, Will, but I don't like you. Anyway, enough on fake people. It was awesome. We hit up the Chinese Theatre to do a tour, where the most excited person was actually the tour guide, rather than anyone else. She almost exploded with excitement over all the pictures. It’s pretty surreal standing in places where unbelievably famous people would stand for premieres or whatever, or even just to see a movie. We snuck into the back of a movie (Cats and Dogs 3D…awesome. Or not) and wandered around a little. It took us FOREVER but we found the Harry Potter handprints, looked at Kodak Theatre and wandered back down the other side of Hollywood Bld towards our hostel. We had Thai, saw a bazillion tacky tourist shops, made zero friends with the ferals in our hostel, who were loud, drunk and rude, and passed out from epic exhaustion. 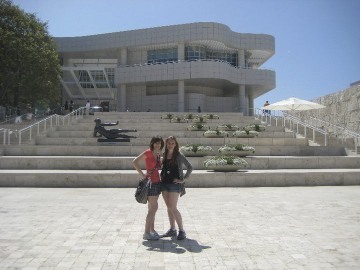 With no time to waste, we were up and catching our first American bus to the Getty Centre in Los Angeles. We had the funkiest bus driver ever, she actually belonged on a TV show – she was black and could totally do the ‘mmmmhhmmm’ thing with her head. We saw a Whisky-A-Go-Go pub (yay for Criminal Law! 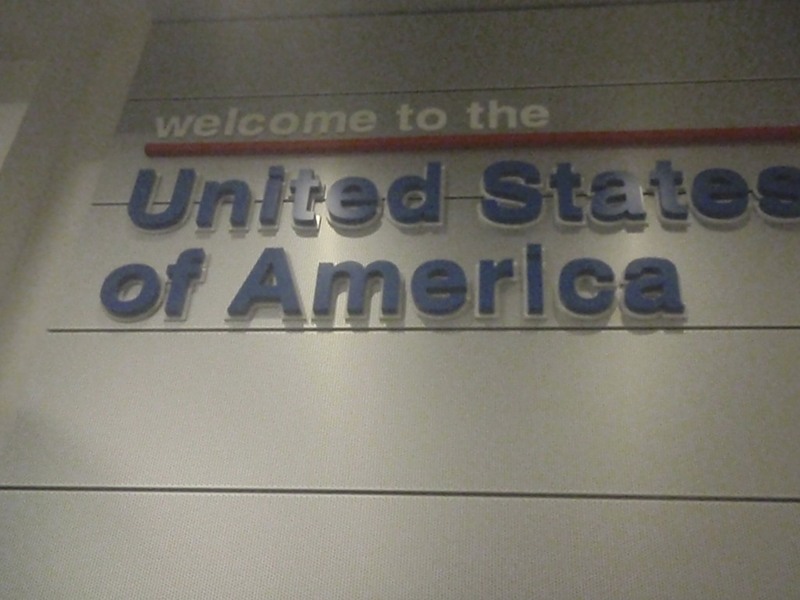 ), and realized just how sprawled out LA really is. We had a quick look at UCLA before catching our next bus out to the Centre. It was SO NICE to see some beautiful houses and greenery. There was a little tram that took us up the hill to the centre, and the centre…wow. It is just beautiful! The artwork and stuff was nice and all, but honestly I could’ve spent the day just sitting in the gardens and admiring the light and the architecture and the flowers and just how peaceful it was, only forty minutes away from the insaneness of Hollywood. After a very confusing lunch, where we encountered for the first time the super self-serve style of buying food that Americans have, we headed to Rodeo Drive. It was only just a lot awesome walking past all these amazing houses with epic security and some with garden walls so high you couldn’t even peek at them. I have no idea whose houses they were, but apparently they were super famous, and I feel a bit special to have walked on their footpaths. Anyway, we got to the shopping district all gross and sweaty, went inside a shop where the wax figures were still playing havoc with our brains and we thought the perfectly immaculate shop assistant was fake, until he started talking to us. Oh the shame! We spent a while on Beverly Boulevard, then went on an epic, hour and a half long search for It’s A Wrap, a store Georgia had heard of…and it was worth it. It was the most cavernous store of all the discarded clothes from TV show and movie studio wardrobes. It was unbelievable. We spent hours trawling through racks and racks of clothing, myself coming away with Hannah Montana pants and a Ghost Whisperer jacket, and Georgia with a MASSIVE haul of amazing Valentino jackets ($150), and some other brand I forget but is famous for only $50. Best shopping experience of my life. I think we could have spent all day in there – Jimmy Choos for $100….if only my entire body was more celebrity-sized! We maximised the ridiculous amount of free wi-fi that connects the city to Urban Spoon our dinner plans in the attempt to avoid the ferals in our hostel. Cheebos was our super fun experience, where we had our first American pizza, although I’m pretty sure it doesn’t count because it was woodfired, wasn’t sold by the slice and didn’t drip grease all over your hands. But it was delicious 🙂 It took us until 11 to get back to the hostel again, by which time we had new roommates, were feeling a lot awesome about our amazing day and extremely excited for the adventures of the next. We made friends with the new English guys in our room, who were travelling for three weeks on leave from work, and checking out California. They gave us some great tips for San Francisco, we chatted about things and then Georgia and I decided it was time to refresh for meeting the cast of Glee and my marriage to Puck the next day! We got up fairly early to pack up our stuff and check out, and headed to downtown LA. To be honest? If you’re thinking of going to LA, don’t bother. It was dirty and a bit gross. But I was too excited to care – we caught a bus down Melrose Avenue, the most surprising street in the world because it was full of really ordinry looking people going to their ordinary houses then….Paramount Studios, a deluxe and amazing looking building. We were almost too late for our tour, BUT God was smiling on us because we made it with time to spare for a perk-up coffee. Our tour guide was totally amazing, we made it clear from the beginning that all we cared about was Glee so he did his best to point out everything associated with the show around the studio! It was again really surreal to be standing in the places where so many famous moments were shot – scenes from Sunset Boulevard and TV shows and Glee of course! There was a TV show filming where we first walked in…they actually use the entirety of the studio area, even the random benches scattered around the place, and there’s a car park that they turn into a massive tank of water for ocean scenes and whatever. You can google it, it’s awesome. We saw some filming of CSI New York as well, but all of that is totally uninteresting because I nearly cried when Lea Michele (aka Rachel Berry) rode past our tour on her bike (from the show! The pink one if you watch it!) and even looked at us! That moment was totally enough for me, until by the car park that turns into an ocean, the ENTIRE MAJOR CAST OF GLEE CAME PAST US AFTER LUNCH TO CONTINUE FILMING. I can’t even tell you the joy I felt. I thought I’d be way too cool t be starstruck, but I was wrong. I kind of just stared in shock at the little golf cart driving Artie and a few others past me, and they noticed I looked completely struck dumb and waved to me!!!!!!!!!! Then Finn ambled past with his big Finn walk (man that guy is massively tall), we saw Quinn in her Cheerios costume, and Santana and Rachel again and Mercedes and Tina and and…it really just was so very unbelievable! I wish I had photos but we weren’t allowed to take any…but it doesn’t matter, I can remember every second of it, as totally dorky as that sounds. The rest of the tour was really just a haze of OMG I SAW THE GLEE PEOPLE so I don’t really remember, but our tour guide did show us where they film all the scenes in the school carpark, and the bench where Principal Figgins does his DVT ad. We did get to go onto the set of Community, starring Chevy Chase as well, and actually one guy on the tour was the uncle of some up and coming guy in a new fabulously popular TV show that I totally forget the name of who came up to our tour and had a chat. And really, after that very surreal moment of my life, we raced back to the hostel, grabbed our depressingly heavy bags, raced to the train and our shuttle and made it just in time for our flight to San Francisco!